Composed by Various. Arranged by Robert Tarchara. This edition: Paperback. Collection. Classical. Book. With Text Language: English. 48 pages. Published by Santorella Publications (SP.TS026). 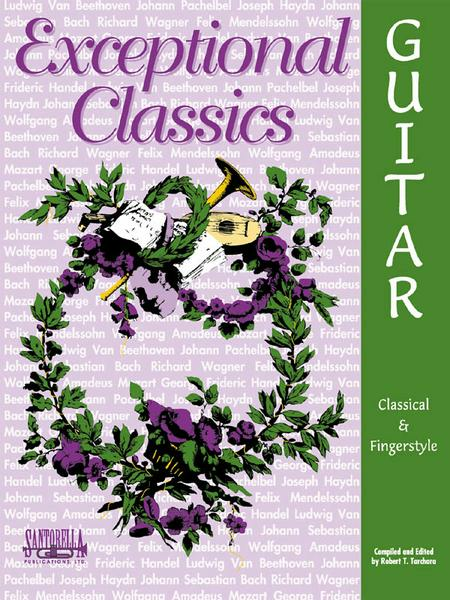 Exceptional Classics for Guitar is a rare compilation of music from the Baroque, Classical and Romantic periods. Unlike traditional method books which frequently feature anonymous and monotonous exercises, Exceptional Classics published by Santorella Publications features the best known classical works from the most talented composers of the 18th and 19th centuries. Having been transcribed from the original piano works and arranged for classical or fingerstyle guitar, extreme care was given to the key choice, left-hand fingerings and octave ranges, which makes each arrangement extremely playable. All these classic titles are perfect for any wedding setting and by paginating without awkward page-turns; this book is performance friendly and appreciated by countless working musicians today. We have also included important biographical information and historical notes about Johann Sebastian Bach, Ludwig van Beethoven, George Frederic Handel, Franz Joseph Haydn, Felix Mendelssohn, Wolfgang Amadeus Mozart, Johann Pachelbel, Richard Wagner and the musical gifts they gave us. We, at Santorella Publications, feel that education is first and foremost and learning about these great men, is truly the key to bringing their works to life. Includes: Moonlight Sonata, Beethoven - Pachelbel's Canon, Pachelbel - Little Serenade, Haydn - Jesu, Joy of Man's Desiring, Bach - Fur Elise, Beethoven - Bridal Chorus, Wagner - Ode To Joy, Beethoven - Sleepers Awake!, Bach - Bouree, Bach - Minuet, Mozart - Two Minuets, Bach - Theme, Handel - Prelude, Handel.